Our trip to Cordoba last weekend was completely spontaneous and random. Last week, I just decided that I needed to get out of Madrid for a while to see something else. I chose Cordoba because I had never been and I know that I wouldn’t ever go if I didn’t have any reason. Knowing that places like Valencia, Cadiz, and Badajoz all have large festivals, I know that I’ll get to those places, but Cordoba? I hear it’s nice in May but what else is there? So I organized a quick trip for Angel, Jose Luis and I.
Angel and I left Friday evening by bus. It was a quick trip: only about five and a half hours. Of course this time was spent with us laughing and messing around like usual, but the ride didn’t get good until we ripped the caps off our Don Simon’s Tinto de Verano bottles. Eventually, we arrived in Cordoba. We grabbed another bus that took us to our hostel. I wasn’t sure we had arrived when our stop showed up because I didn’t see any sign or any one for that matter. But Angel spotted the hostel. We got in: It was some old house or apartment building and some guy from New Zealand ran the place. We checked in and then immediately set out for food and then to visit the night life since it was already about 10.30pm. We looked at a few restaurants, but ended grabbing the most Spanish food you can eat. Forget paella: We got kebabs. Then we went to this really awesome bar called Soul and that name really stands for what the place was like: They jammed old disco and original R and B tunes. To say the least, the place had a ton of soul. We chilled there for a while and then went to see what the clubs were like. There were only three. And our options were slim. There was a pijo club, a top 40 club, and a rock club. Which do you think we chose? Seeing as the rock bar was also the only one that didn’t charge a fee to get in, we chose that. The night was your typical night in Spain with loud music and lots and lots of people. However, it was very strange because the streets in Cordoba were absolutely empty with people. There was no one around, but I’m pretty sure they were all inside this bar. The following day we woke up, got a real Spanish lunch (not kebabs), then we hit up the Mezquita which is one thing that I really did want to see. We spent about an hour inside there, just walking through the thousands and thousands of columns that litter the place. Afterwards, we meandered through the orange-tree courtyard that sat in front. The weather sunny, despite it being very cold. We retreated back to the hostel to get Jose Luis who finally arrived that afternoon. The first thing we did was go see the Museo de Andalusia which was kind of a drag, but the view from the top was terrific and probably worth the three euros we paid to get in. So from the Museum, we went to see El Alcazar, but that was closed, and then we tried to see some famous Synagogue in the Jewish district, and that too was closed. So we bought food, and went back to the hostel to make dinner. We chilled there, talking, laughing as always, and eating. Then finally, we all got ready and went out. We ended up back at the same rock bar, called Long Rock (just in case you wanted to know what it was called) because again, it had the most people, and there was no cover charge. The following day was where we really went awry. We woke up a bit late and went and ate lunch. We all got Rabo de Toro (bull tail) which is what everyone told us to try there. And truth be told, it was absolutely delicious! After we finished eating, we went to see the El Alcázar, but right as we got there, they were closing! And it was only two in the afternoon! This really pissed me off, but whatever, there are somethings you just have to get over. So we tried to see the same synagogue from the day before and that too was of course closed. So we killed our last few hours wandering and then we rested in this wonderfully sunlit park and just enjoyed the warmth. Then Jose Luis caught the express train that only takes 2 hours to get to Madrid, and Angel and I, los pringaos, we caught the five-and-a-half hour bus back. On the whole, Cordoba was a lot different than I was expecting. It was pretty small, and there was no one. The whole city seemed completely deserted. The historic district was nice with typical tight, curvy streets, but the rest was just flats and offices. 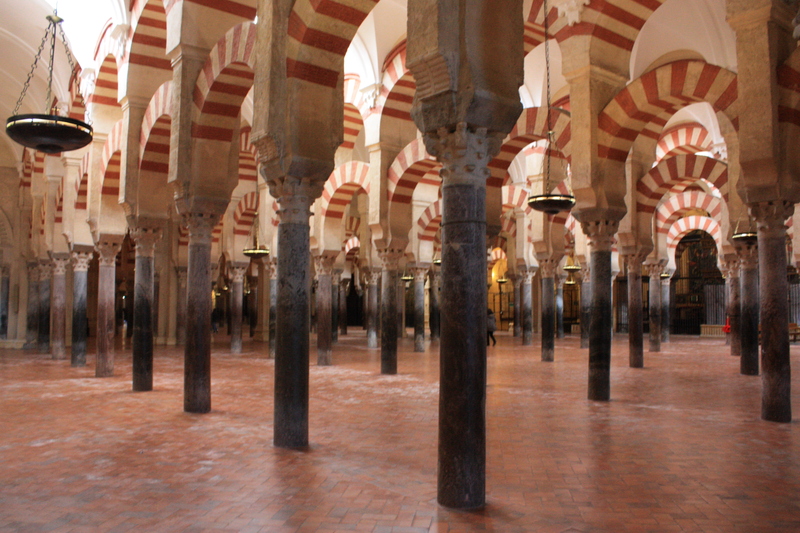 It wasn’t the most beautiful place and I was a little disappointed that the Mezquita didn’t really hit home like I was hoping it would. But either way, I’m very glad we got to see something new and get out of Madrid for a while.